Since I became a blogger in 2014 I have always found myself on journeys to find myself and understand my own personality and how to adapt myself to particular things. I think I was so influenced by others that my personality had changed and altered to fit in with society, especially during my young teenage years - which I guess, is actually a shame. However, I do believe I have found myself after different events that have happened in my life, and that being yourself is truly amazing. I recently discovered the Personality Match App (personality perfect.com) and it has really given me inspiration on what to do in life based on my personality - which is exactly the aim of the app. It is a very positive and inspiring, so I am thrilled to explain to you guys exactly what it is. I feel like this app is so interesting to actually find the tips to actually getting along with someone. I personally, looked at the app as fun and interesting, to see what comes up. To start with, I took the App's free personality test - and then get a friend to do the same. 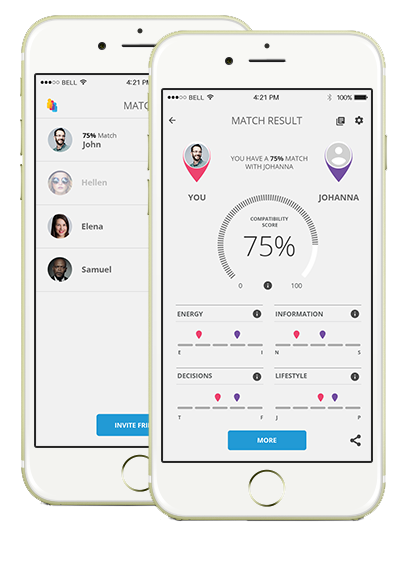 The app then reveals and compares both of your personality types and compatibly. The other thing about this is that they also tell you why you are compatible and in what areas - as well as giving you possible conflicts that could arise between the pair of you and how to resolve them. It kind of reminds me of one of those "Love Meters" us girls would put ourselves in with a boy we fancy at school. Memories. take a try and see what you get!